When cooking this pizza on your barbecue, preheat to 220ºC (the burners should be set at high). Place racks inside 2 large baking trays. Place in the centre of the barbecue, side by side, to preheat. Place mince in a bowl and mix in oil and fajita spice mix. Heat a large pan, ensure it is moderately hot. Crumble in half of the mince. Brown the mince, breaking up any lumps with a fork. Remove first batch, reheat pan, cook remaining mince and then remove it. (If using chilli, add it into the beef mince when cooking). Spread pizza bases evenly with salsa. Top with beef mince. Sprinkle with cheese. Place on preheated trays in barbecue. Lower hood. Barbecue for 12-15 minutes or until bases are crisp, cheese melts and is golden. 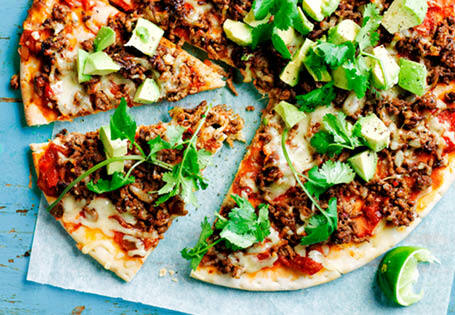 Serve beef pizza sliced and topped with avocado, coriander and lime wedges. Tips: The beef pizzas can also be cooked in the oven. Preheat oven to 220ºC (or 200ºC fan forced). Bake directly on oven shelf for 12-15 minutes, swapping pizzas halfway during cooking. Cooking the beef pizza on raised racks in the barbecue ensures that the air circulates evenly and produces a lovely crisp base. *A sachet of taco seasoning can be used instead of the fajita spice mix. 450g El Tora chunky salsa. Lime wedges and chopped coriander leaves to serve.